The icon of Australia, the kangaroo sits proudly on top of this delicate sounding wind chime. This bristlerush kangaroo wind chime is light-weight, which makes it easy to send as a gift or for hanging anywhere in your home. Our online store has a variety of native Australian wildlife for you to choose from. These animals look great on their own but will give your home a real Australian flavour when they're joined by other wildlife species such as the gumnut koala joeys, the indoor/outdoor Platypus, coasters, kids toys, sheepskin pyjama bag holders and more. 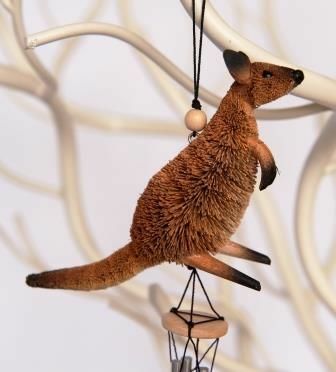 These Aussie Wildlife Wind Chimes are easy to hang, are perfect for wrapping up and sending as a gift. Australian made and themed wrapping paper and cards are also available in our online shop.